You can have children only if you are married and have upgraded the Farmhouse for the second time. After you go to bed for the night, your spouse will ask if you want to have/adopt a child. You can answer "yes" or "not now." Same-gender couples will adopt children, and opposite-gender couples will have biological children. You can only have two children, one male and one female. The gender of the first child is random, and the gender of the second child is the opposite of the first child. Children never grow up past the Toddler stage (Stage 4). You will have the option to acquire a second child only after the first child has grown to the Toddler stage. If you maintain a 10-heart relationship with your spouse, already have the nursery, and have been married for at least 7 days, there is a ≈5% chance that he/she will ask if you want to have a child. If you agree, the baby will be born after 14 days and appear in the crib in the nursery. If you say "not now," there will be a ≈5% chance that your spouse will ask again, each night that you are married (and maintain 10 hearts). 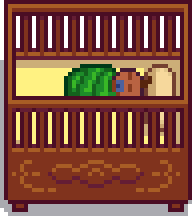 For the first 14 days in the nursery, the baby will stay sleeping. After this, it will begin to stand in the crib (except when sleeping) for another 14 days, but you can play with it. When this stage is passed, it will be allowed out of its crib for another 28 days to crawl around in your house during the day. Finally, the baby will enter the toddler stage for the rest of its life. It will start sleeping in one of the beds in the nursery, freeing the crib for another child (if you do not already have two children). 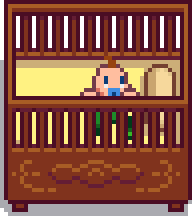 Be careful not to complete any Community Center/JojaMart bundles the night before the baby is due as it could cause the event to be skipped entirely. The adoption process is very similar to having a child biologically. If you maintain a 10-heart relationship with your spouse, already have the nursery, and have been married for at least 7 days, there is a ≈5% chance that he/she will ask if you want to adopt a child. If you agree, the adoption will occur after 14 days. While you are waiting for your child, your spouse will tell you that he/she has filed the adoption paperwork. Your child will appear in the middle of the night, with a note saying that the adoption agency dropped off your new baby. Interactions with the child will always result in "[child's name] is sleeping.". When interacting with the child, the player will toss it into the air, which improves the relationship level. 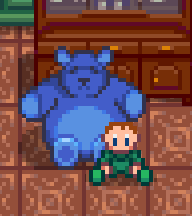 You can also toss the child while sleeping for a funny animation. The child will crawl around the house and play with toys. Sometimes it might be buggy and get stuck in furniture. At night it will be put back into the crib automatically. The child will dash around the house. You can right click on the child to interact and increase the relationship level. Children can be dismissed late game by interacting with a dark shrine inside the Witch's Hut. By offering the shrine a Prismatic Shard it will allow players to turn children into doves, making them leave the farm forever. Once dismissed, children are gone for good and cannot be returned. 1.1: Dying or passing out the day before will no longer skip the birth event. Added ability to dismiss children via a shrine at the Witch's Hut. This page was last modified on 19 April 2019, at 22:54.